A four-step plan to scaling Green Mountain Power's distributed energy efforts. Vermont utility Green Mountain Power has done a lot more than most utilities to put distributed energy resources in the hands of its customers. Enabled by a unique state regulatory structure, GMP has created lease and on-bill payment offerings to give customers Tesla Powerwall batteries, grid-responsive water heaters, Nest thermostats, and no-cost electricity for charging electric vehicles during off-peak hours. But less than 3 percent of GMP’s customer base is currently using one of these offerings, according to a new report from the Rocky Mountain Institute. That adoption rate will have to grow tenfold or twentyfold to help the utility meet Vermont’s aggressive clean energy goals, including its 75 percent-by-2032 renewable portfolio standard with a 10-percent carve-out for distributed energy, up from less than 1 percent of the utility’s clean energy profile today. RMI’s report lays out a path for the utility to meet these growth goals, through “expanded marketing and customer engagement, high-saturation deployment approaches, and new program design including bundling of services and provision of alternative financing options." RMI’s analysis notes the plethora of programs GMP has launched to diversify beyond the traditional utility business model. The power provider, which serves 220,000 residential, 41,000 commercial, and 70 industrial customers across 7,500 square miles, has officially dubbed itself an “Energy Transformation Company,” with an eye on tapping all available opportunities emerging from low-cost solar, batteries, electric vehicles and flexible energy controls. GMP first deployed energy storage, smart thermostats and load controls in homes and businesses as part of its “Energy City of the Future” project in Rutland. But it’s also been able to market DERs directly to its customers, under an unusual state regulatory regime that gives the vertically integrated utility the ability to tackle novel projects, like behind-the-meter battery financing, more quickly than usual. In 2015, it launched a first-of-a-kind program to offer up to 500 Tesla Powerwall batteries for $37.50 per month, a deal that included customers getting backup power in exchange for letting the utility tap the batteries to manage system-wide or local peak conditions. Last year, GMP tapped the experience from this pilot, as well as the beefed-up capacity of the Tesla Powerwall 2, to drop the lease payment to $15 per month, as well as increase the duration of its emergency backup capacity — an important service in a state with many rural residents served by storm-sensitive power lines. GMP has also focused on big electrical loads like heating, an important peak contributor during winter months. Last year it launched its eSmartwater program, a pilot that’s targeting about 500 customers with an offer that includes electric water heater controls from startup Aquanta, combined with a free Nest thermostat, for a fee of 99 cents per month. 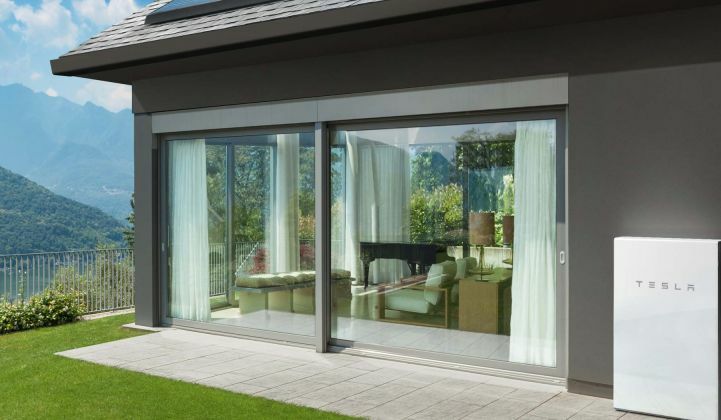 Its eControl program offers a similar free, connected control device for customers with ductless heat pumps, available for dispatch for demand response or grid services. And for the significant minority of Vermonters who live off the grid, GMP started offering solar-battery-energy management systems in an “Off-Grid Package” in late 2016 — an interesting example of an investor-owned utility expanding its customer base beyond its wires and meters. But to date, only about "6,000 residential customers, or 2.7 percent, have participated in any innovative offering,” RMI wrote. 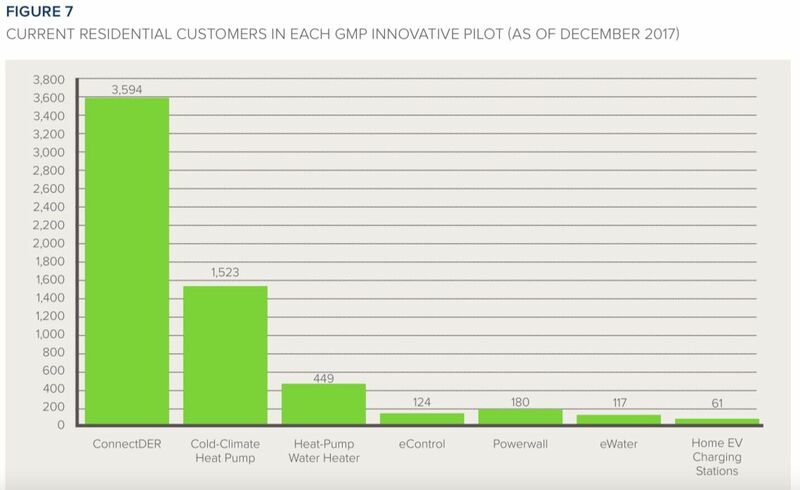 The breakdown for customers using each type of service as of December 2017 indicates that the vast majority are using the ConnectDER meter collar for rooftop solar grid interconnection, with heat pumps and water heaters a distant second and third, and only a few hundred using its Powerwall, eControl and eWater systems. Here’s RMI’s four-step prescription for GMP to ramp up its uptake. Ramp up efforts on customer data collection, analysis and decision-making. "GMP can use existing smart meter data and new customer research to segment its customers into personas (groups of residential customers) and cohorts (groups of business customers)," both to better market products to customers and to better design programs and rate structures. RMI also suggests targeting “high-saturation adoption opportunities” for "tightly knit social networks” such as campuses, neighborhoods or community and religious groups, combining bulk purchase structures with “well-timed default customer offers” — that is, act-now offers. RMI suggested as a model the “Solarize” nonprofit, community-sponsored group buying and discount programs that requires group participation in a limited time window to capture a compelling deal. Design bundled offerings to "overcome cognitive confusion and leverage integration.” These are fancy terms for using all the data available to match homes and businesses with the optimal mix of GMP’s distributed energy offerings, from standard bundles for certain customer segments, to personalized bundles built on an eHome audit or building efficiency retrofit. Test alternative financing options that make offerings affordable. GMP currently offers lease options for several home devices to allow customers to participate in offerings with no money down. In addition to the lease, GMP can offer an on-bill tariff program that creates opportunity for customer ownership, eases the complexity of transferring responsibility when a home is sold, and expands GMP’s ability to finance solutions for customers who do not meet traditional underwriting standards. GMP is facing the same trends as the rest of the U.S. utility industry — flat or falling demand for energy, amidst increasing costs of managing the infrastructure to deliver it. The utility forecasts demand will fall by up to 180 gigawatt-hours, or about 4 percent, over the next 10 years, representing $20 million to $30 million in lost revenues. It’s also facing a steep increase in renewable energy. Vermont has set a goal of getting 75 percent of its electricity from clean energy resources by 2032, building on a 2016 generation mix that included 40 percent hydro and 14 percent nuclear, with an additional 18 percent generated from renewable sources including wind, hydro and solar. The utility sold that clean energy for renewable energy credits in 2016, giving it an overall 40 percent renewable rating for the year, and planned to retain those credits in 2017 to hit the state’s 55 percent renewable target. Vermont also has an unusual set-aside for distributed energy under its “Tier II” requirements, which ratchet up the share of GMP’s clean energy coming from distributed generation from less than 1 percent in 2017 to 5 percent by 2023 and to 10 percent by 2032. Even beyond those goals, Vermont is already independently forecast to reach close to 7 percent penetration of distributed energy by 2030, RMI noted. This approaches the same penetration rates that have provided solar-rich states such as Hawaii, California and Arizona with grid challenges. GMP has been taking these challenges into account with its Tesla Powerwall deployments, which are partly financed by the values they’re expected to provide in reducing the utility’s need to upgrade circuits and transformers in hard-to-reach areas, as well as shaving systemwide demand to manage costs imposed by grid operator ISO New England. To hit the additional targets “will require tens of thousands of GMP customers to adopt heat pumps, heat-pump water heaters, and/or electric vehicles over the next 15 years,” the report noted. About 1,500 cold-climate heat pumps have been deployed, but more than 30,000 may be needed by 2026 to meet Tier III targets, it noted. And to reach the state’s goal of 10 percent electrification of the passenger vehicle fleet by 2025 will take a twentyfold increase in the number of electric vehicles in GMP’s service territory, from 1,500 today to more than 32,000. But these are all also good thing for utility revenues — “each cold-climate heat pump, heat-pump water heater, and electric vehicle adds an estimated $600, $150, and $300, respectively, of annual revenues through load growth,” it noted.